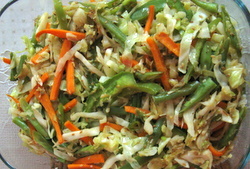 Vegetable Stir Fry Recipe - Enjoy The Crunchy Vegetables. Vegetable Stir Fry is a quick and easy way to eat tasty vegetables. This is one of the very healthy recipes,with all the right ingredients.The vegetables remain crunchy and retain most of their nutrients.You can use any vegetables of your choice. Stir frying is a popular Chinese way of cooking.Hence,it is important that you prepare all the the vegetables before you start cooking(wash,peel,shred or slice).Also,keep the rest of the ingredients ready.Once that is done,cooking won't take long. Prepare all the ingredients as required and keep everything ready at the kitchen counter. Heat a wok on a very high flame.Add the oil and put the ginger and garlic in it and stir for 3 seconds.Now add the chili and stock cube.Stir for 5 seconds.Keep stirring.Add the carrots and beans ,stir fry for a minute or two.Next goes the cabbage and celery leaves.Keep the flame high. Stir all the time to avoid the veggies sticking to the wok.When the cabbage wilts a bit and no water is left in the veggies,add the green bell pepper and stir further.Add the black pepper. Check if the salt is ok (the stock cube contains a lot of salt). Add more if needed. Serve as a side dish with noodles or rice.